Tonight we're putting a healthy spin on the always popular Chinese dish orange chicken! Orange chicken is one of our favorite take out dishes but let's be honest, crispy fried chicken in a heavy, greasy sauce ... not exactly a meal you can feel good about eating! 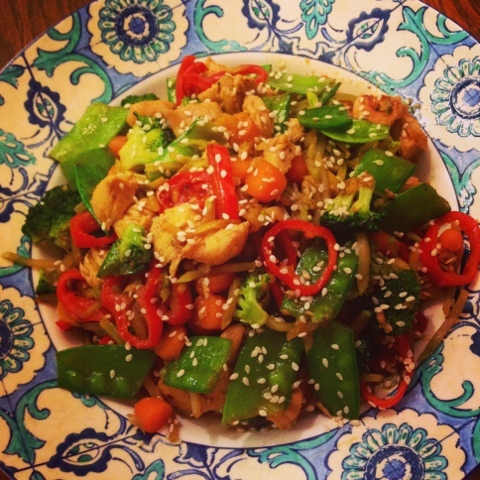 We took all the same flavors of this classic and turned it into a delicious & nutritious chicken and veggie stir-fry. We used a combination of red bell pepper, broccoli, pea pods and carrots for lots of different colors and textures. This is the perfect meal to make if you're trying to get your family to eat more veggies too! The whole dish takes on the flavors of this delicious sauce which has the perfect balance of citrus and sweet! We make it with a combination of orange juice, low sodium soy sauce, rice wine vinegar, chicken stock & a just a hint of brown sugar. 1. To make the sauce combine orange juice, soy sauce, chicken stock, rice wine vinegar and brown sugar. Whisk together to combine. 3. While rice cooks, cut the chicken into bite sized pieces and season with salt & pepper. 4. Finely chop garlic and separate into 2 piles. 5. Heat pan over medium high heat and add one tsp of olive oil. Add half the garlic and chicken to the pan and stir occasionally. Once chicken is almost cooked through, add one tbsp of your sauce to the pan to coat the chicken and remove from pan. 6. Slice up veggies and toss with remaining garlic. Add 1 more tsp of olive oil to the pan and sauté veggies until tender crisp. 7. Return chicken to pan and coat with your yummy sauce. 8. Portion rice into 4 bowls and dish out stir-fry. Top each bowl with sesame seeds to finish. Well thanks for sharing this recipe because I think it was very delicious and easy to cook. You can also try to do a Recipe for Stir Fry Sauce. Because I don't know how to do it. I will visit your blog again to check that recipe.